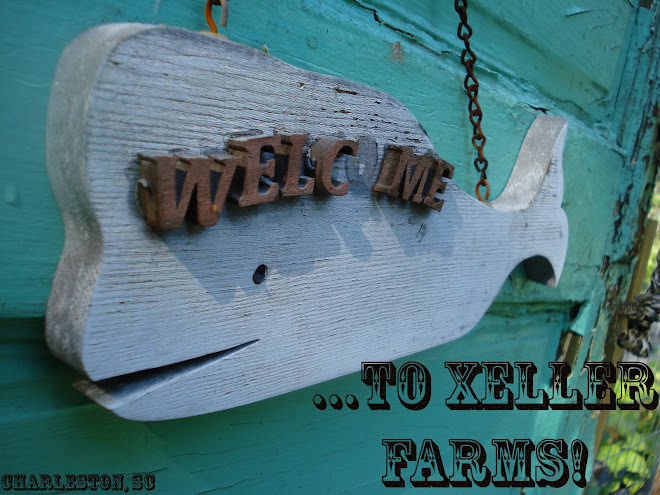 Xeller Farms: Rainy Day - First Harvest! This past week I worked on getting the compost cleaned up a little. The dogs have been getting into the compost bin and eating the food in there. The bottom of the bin has little doors and Brooklyn (our little whiz kid) figured out how to open these doors, climb in and grab a snack. So she and Brodie have been helping themselves for a while. We've used some of the hardware cloth and the wheelbarrel to keep the little doors shut, but they got in again. As a result, Brodie puked all over the bedroom floor at 5 in the morning a few days ago. So I put myself to work building a temporary fence for the compost. I say temporary because it started raining hard right after I started, and I aborted the original "Mission Impossible: Keep Dogs Out." So far (fingers crossed) it's been working. In the photo below you can see Brodie eyeing the fence and thinking, "hmm... I better consult Brooklyn on how to break through this barrier!" Two days ago I was sitting in the living room, reading ( a gardening book, what else?) and I happened to glance outside. I saw a hummingbird at the feeder! I was just thinking about how I needed to take down the feeder and make new food because it's been out there for a while, and there he was. I'm sure he got one taste of the water and thought, "ick, don't need to come back to this bar!" I actually had the camera on hand, so I took a quick photo of him. Here's another visitor to the yard. This little guy was sitting inside the compost bin. See how fat he is? He's probably be snacking on all those bugs that live in the bin. I initially thought this was a green tree frog, but after zooming into the photo and seeing rougher-than-normal skin as well as some subtle patterns, and then noticing the yellow on his hindlegs, I thought - maybe grey tree frog... but that doesn't seem entirely right either. Could it be a hybrid? Do I have any frog experts out there in blog world? Get ready for this one: The morning glory is blooming!!!! I thought it would have red flowers! Guess not. It's still really pretty though. If it ever stops raining I'm going to get Dan to help me carry it around front so it can cheer up the front door and grow up a trellis. These are the only photos I took today. Since it's still raining (enough already!! ), I just took a quick snapshot from the sunroom to give you an idea of the jungle the garden is becoming. I went out and picked some veggies for dinner! It will be the first meal from our garden and I am so excited! and three small zucchinis. Yes they're small, but there's plenty more growing. All this will be seasoned with fresh herbs from the garden. Oh, I almost forgot, the corn has silks and there is an actual eggplant growing! AND there are teeny little beans on the plants. I'm so excited for those beans! More photos next week when it has stopped pouring.